The variety I tried was called Bacon, Egg & Cheese Biscuits, described on the box as "flakey buttermilk biscuits filled with egg, cheese & veggie bacon crumbles." These breakfast biscuits are delicious. The biscuit is flakey with an almost Southern diner feel. Biting in, you're immediately hit with an unexpected smokey flavor that brings to mind campfire breakfasts. If you like cheese, you won't be disappointed. It'd be fair to capitalize the word "cheese" in the name. The egg doesn't necessarily taste like egg and the bacon doesn't taste exactly like bacon, but the whole thing, mock meat and all, tastes like a very good breakfast sandwich. Don't analyze it too much and I bet you'll enjoy it too. I found the microwave time to be a little off. I had to microwave each biscuit 10 second longer than directed for the product to be completely warmed through. It should be noted that that "veggie" aspect of these biscuits refers only to the bacon. 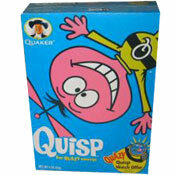 The product contains real egg and real pasteurized process Cheddar cheese product. If you follow a strict vegan diet, you're out of luck with this one. 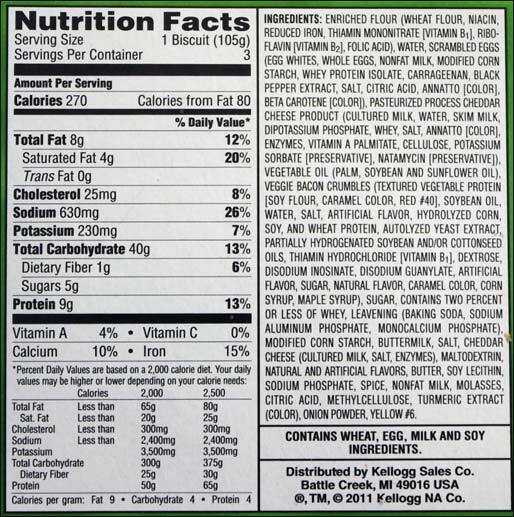 Nutritional considerations: Each single biscuit serving has 270 calories, 8 grams total fat (0 trans and 4 grams saturated), 40 grams total carbs, 1 gram dietary fiber, 5 grams sugar and 9 grams protein. The ingredient list is amazingly long. I've included a picture of the label here so you can dive deeper into the nutrition facts. Another variety called Sausage, Egg & Cheese Biscuits is available. Please leave a comment below if you've tried either variety. I'd love to hear what you think. 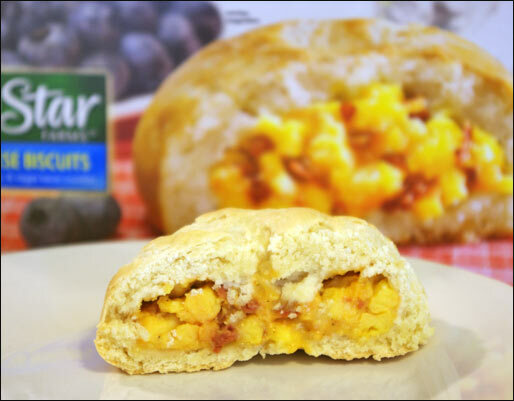 What do you think of Morningstar Breakfast Biscuits? I loved the sausage, egg & cheese biscuit. Can't find them anywhere. Breaks my heart. I probably bought at least one box a week. I love these and I hope they don't stop selling them. I loved these so much but hated the price, so for 1/4 the cost I started making my own. Super easy! And delicious just the same! I love both the bacon and the sausage kind. It's a good breakfast for on-the-go, because it tastes like a sit-down breakfast. Very good product! Both the bacon and the sausage ones are great. I usually buy both and alternate. I keep these in the freezer all the time. I really like this breakfast item... the bacon, egg and cheese biscuit variety. I was pleasantly surprised how much my grandsons enjoyed them too, ages 13 and 9. We will be buying these again! I think it is outstanding! The best microwaved breakfast that is vegetarian. I microwaved mine for 1 minute. Very good! I didn't think it was that great. It tasted good, but for the price... no way. I question whether the people who gave this negative reviews really tried it. It is really, really, delicious. I think it's the best microwave breakfast going right now. I highly recommend it. I didn't care for this product. I thought it was nasty. These biscuits are really, really gross... I'm sorry, if it was anything but a biscuit I would eat it! 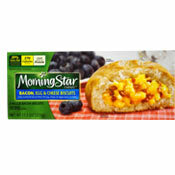 I have tried both of the NEW Morningstar Farms Breakfast Biscuits and like them both. Even though the biscuit part has the same great taste I like the Sausage, Egg and Cheese more then the Bacon , Egg and Cheese. I am simply more fond of the sausage taste. Both flavors are EASY to make (about one minute unwrapped in the microwave we have)and both are quite tasty. When you compare them to the only previous option of a similar product that was available - Smart Ones Morning Express English Muffin Sandwich With Egg Whites & Cheese - you realize just how much easier they are to make then that option. Cooking that sandwich was always an attempt of trying to cook the sandwich with the hope there are no frozen parts left. With these tasty biscuits that is not a problem. It takes less then two minutes from the time you remove them from freezer, remove the wrapper and cook them in the microwave. With few exceptions (Morningstar Turkey burgers for one) I am always impressed with the taste and quality of the Morningstar products. There are surely tastier options available then there were 30 years ago when I first became a vegetarian. Today maybe they are to many options since before being a vegetarian was so restrictive that my weight was never a issue as it is today. But anyway when it comes to this product they come three to a box , cost me on sale about $3.50 and are something I will buy again and again.